Der Artikel Implore: Depopulation wurde in den Warenkorb gelegt. It's a bit hard to pin down where IMPLORE are really from. The band members live mainly in Hamburg these days, but lead vocalist and bass player Gabriel Dubko was born in Argentina, and has lived in Barcelona, LA and Hamburg. This is where he met guitarist Daniel at the train station, after a gig at the legendary Rote Flora – squat, and this random encounter gave birth to IMPLORE. A few weeks later, Heaven Shall Burn's Christian Bass joined the band as a drummer, and this was the first line-up of the three-piece. Due to his commitments to HSB, Bass couldn't record IMPLORE's first EP »Black Knell«, so Dubko got Suffocation's Kevin Talley to track drums instead – not a 2nd rate replacement at all. »Black Knell«, released on July 4th 2014, was furiously celebrated in the grindcore and crust scene and instantly opened up a lot of doors and touring opportunities for the band. A European tour with Californian power-violence band ACxDC was getting booked at a time when IMPLORE had not even played a single show yet. The band stood their live-ground during this first tour, with shows opening for Nails and Festivals like Obscene Extreme & Fluff. More tours followed, and with Michael Pfeffer joining the band as a permanent live drummer, IMPLORE finally had a solid line- up. 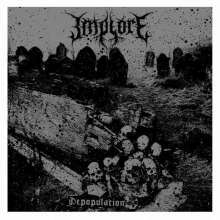 »Depopulation« is the first album of this very young band, that in its less than 2 years of existence has already toured Europe several time, as well as the US and even Mexico. »I have never seen such a dedicated and passionate audience like in Monterey«, Dubko recalls, »we were treated like metal gods«. The band recorded with Earthship's Jan Oberg at his Hidden Planet studios in Berlin, and Christian Bass from Heaven Shall Burn behind the drumkit once more. The album's 16 tracks clock in at just under 30 minutes: »Depopulation« has everything you want a solid grindcore album to have: gnarly riffs, super fast blast beat attacks, harsh, feisty vocals and that particular Swedish guitar tone we all love so much.